Sly Dunbar (drums) and Robbie Shakespeare (bass) are the premiere architects of modern Jamaican music. Widely acknowledged as reggae’s greatest rhythm section, the pair has arranged, produced, or played with every prominent Jamaican artist from Beenie Man to Gregory Isaacs, and with many artists outside reggae including Ben Harper, Bob Dylan, The Rolling Stones, Santana, Alicia Keys, the Fugees, and Michael Franti, among many others. 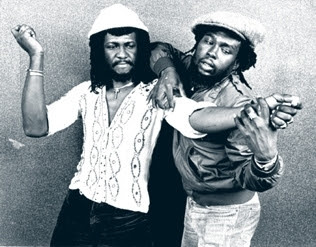 The “Riddim Twins,” as they are widely known, were a driving force behind the fabled Channel 1 sound that dominated reggae throughout the late ‘70s and early ’80s. Subsequent work, most notably with Peter Tosh and Black Uhuru, set the pace for the changing sound of reggae in the post-Bob Marley era. Their group, the Taxi Gang, composed of Jamaica’s top recording musicians, veers from classic reggae to experimental jazz-reggae, featuring an expansive horn section. Tulsa Roots Music is dedicated to bringing reggae’s top acts to Tulsa, and it doesn’t get any better than Sly and Robbie. Big thanks to the Cherokee Nation for sponsoring the day’s activities.